British fashion designer, Mary Quant opened the doors of her new boutique "Bazaar" in London, England in 1955. The clothes were unique for the time period in that they did not mimic their parents clothes, these were fresh, different, like miniskirts and hot pants, the models that wore them were Twiggy, Jean Shrimpton as well as Mary herself, who was the same age. This became the mod Street Fashion clothes of this time period. The logo that Quant used was a bright orange Daisy and is the name she gave to her doll. Daisy is 9" tall and was made from 1973 to 1983. Daisy has long blonde hair or other hair colors, bright face paint with blue eye shadow and a jointed body. 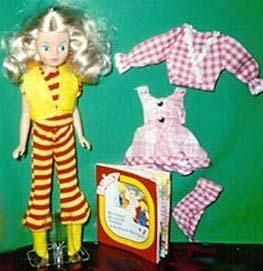 Daisy wore mod clothes that reflect the designs Mary made popular, The Daisy doll shown above, is in her original yellow and red striped two piece outfit, (the boots and vest are from Barbie's Western Wild outfit 1970-1971) with booklet and extra outfit Moscow; Miss Muffet, which is a pink and white gingham three piece outfit; dress, jacket and scarf. Daisy's wardrobe was designed for an around the world trip, so outfits are named for the location visited i.e. London, Moscow etc. and then given a title and were manufactured in Hong Kong. We think Daisy was probably sold at JC Penney stores in the USA, as the clothing line was sold there, she was sold throughout Europe, Canada and elsewhere.